Beautiful and spacious town home located in prestigious community of Canal Corkran can sleep, sit and serve 10 in style. Enjoy the large community pool and pond views from the covered porch or second floor deck. Utilize the gas grill and fully equipped kitchen that has all stainless steel appliances and granite countertops. Prepare your meals and serve them in a large separate dining room or walk to Rehoboth Ave and enjoy the countless restaurants and activities. There are two master suites with private bathrooms and plenty of room for the kids. A full size crib, jogging stroller and high chair are also available for your littlest guest. Take a walk on the community paths, bring your bike or Kayak and explore the Lewes-Rehoboth trail and canal. You will be less then 1 mile (or 8 blocks) from the beach. This home offers very spacious living areas with a separate dining room that seats 10 and an open family room with 9 ft ceilings and great views and sounds of a large pond. After a fun-filled day at the beach, or golfing, or shopping at the outlets, relax by taking a dip in the community pool that is just steps away or sipping a cold drink on the covered patio overlooking the pond. Enjoy the fully equipped gourmet kitchen to prepare family meals which opens up to the living room. The open design has an integrated breakfast bar complete with bar stools for casual dining at the kitchen or a perfect conversation area for entertaining. The patio and its furnishings are under shade for most of the day and is an ideal location to cool off, have a cup of coffee, or enjoy a cook out. $500 damage deposit required. Return of Security Deposit is made within 2 weeks after departure date PENDING inspection after tenant check out. This is a smoke free and pet free property. Any violation of this rule will result in immediate termination of agreement and loss of full deposit. 50% deposit due upon receipt of lease agreement / 50% due 60 DAYS prior to arrival. Guests under 25 years old must be accompanied by an adult. Now is the time to reserve this beautiful premiere townhouse. 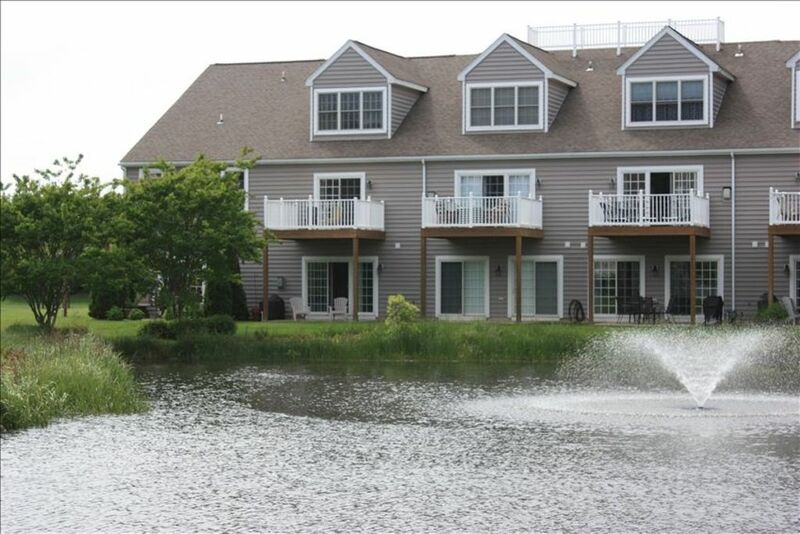 It will be hard to find another vacation home that offers as much – the convenient location to the beach and Rehoboth Avenue, the comfortable and stylish living space for up to 10 people, the large community pool, the pond views, and the relaxing environment - come join us at Rehoboth Beach! We love Rehoboth Beach and enjoy every minute we get to spend together as a family. The location of our home is perfect for us. It is close to everything...the beach, the shops, the restaurants. It gives us a place to land after a day at the beach, or a long bike ride on the trail, or a swim at the community pool. So many options so little time! Boardwalk is 3/4 of a mile from property. Great to walk or bike ride to beach. Only a block off Rehoboth Avenue. Easy walk to restaurants and shopping. with ceiling fans in each bedroom, except bunkbed room. 2 designated parking spots are available right outside property. Overflow parking available next to community pool, just a short walk from complex. beautiful view of water / fountain. ceiling fan to help keep things cooler in summer. Keuig Coffee Machine AND Regular Drip Coffee Machine. Bring your own filters or pods. DVD players available in living room, master bedrooms, and queen bedroom. Covered Patio overlooking large pond. Table with seating up to 8 people. Large deck off of 2nd level master bedroom with lounge and love seat. Boogie boards Beach chairs Umbrella Some are available in storage closet. Large Community pool, steps from back door. Hrs of operation 8am - 8pm. Pool opens Memorial Day weekend to middle/end of September. Adult swim hrs 8-10am and 7-8pm each day. Bring your own SHEETS, TOWELS, wash cloths, hand towels, bath mats etc. Kitchen towels also needed. Linen service may be sub-contracted through local company. http://sheetsatthebeach.com/ Bring your own K-Cups for Keurig Coffee Machine.There is also a regular drip coffee maker as well. When booking, please provide the total number of guests, their ages, and their relationship to the primary renter. Also, when reservation is confirmed, provide full contact information including full name, mailing address, and best contact numbers. Owners were very friendly & accommodating; allowed extra time (early check in; late check out) since it was off season. We loved spending our Thanksgiving at this beautiful home. This is a very comfortable and well decorated and appointed home. We celebrated a special birthday and needed a second home to accommodate all our guests and this fit the bill perfectly. The owner is very responsive and attentive. We would rent again! Wonderful home and highly recommend. The owner was great and very responsive. Spacious and beautiful home! The deck off the master overlooks a fountain which was so relaxing. The house was updated and clean. We loved how it was family friendly. Cheryl was very friendly and accommodating. The location and setting was perfect. In for a wedding. This 3 level town home is really nice. Comfortable, updated property was a perfect spot to be. Easy access to beach, shops and wedding activities at the beach made it a great choice. Wonderful home and very responsive owner! Our 2nd time staying here. We love this home so much we came back for a second year in a row. The owner is very quick to respond if you have any questions or concerns. Highly recommend staying here! Luxury TH, Sleeps 10, East of Route 1; 1 Block off Rehoboth Avenue; Easy walk to town or boardwalk (about 3/4 of a mile). Community pool passes included with rental (1 min. walk). Biking on the Junction and Breakwater Rail Trail, the boardwalk or in Cape Henlopen State Park is great fun for the whole family. Grove Park (tott friendly) is 5 min. walk across the canal for swings, slides, horseshoes, shuffle board and a picnic area. Please review rental agreement prior to making reservation. More information about checkin and checkout will be sent after final payment is received.